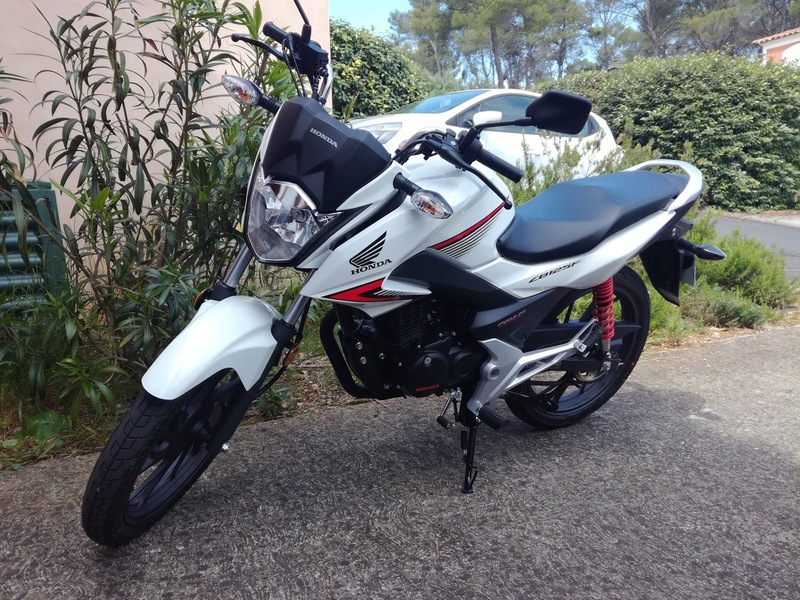 I've had a lovely day today on my motorbike - a Honda CB125F that I've had since May. 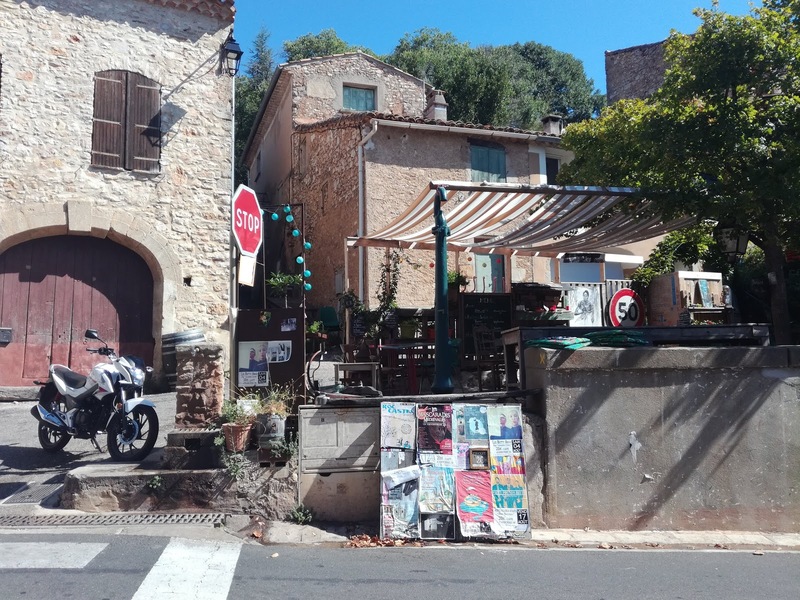 I was intending combining my coding skills with creating a new blog for my motorbike adventures, but I'm not quite there yet, so as I wanted to document this trip, I'll do it here. The furthest I'd been until today was to Mèze for an oyster lunch, a mere 40km away. Millau is 154km and, avoiding the motorway, a nearly 3 hour ride. Before leaving home, I popped down the road to buy a crusty baguette and dried ham to make a sandwich for lunch, downloaded the itinerary into my phone and set off around 10am. 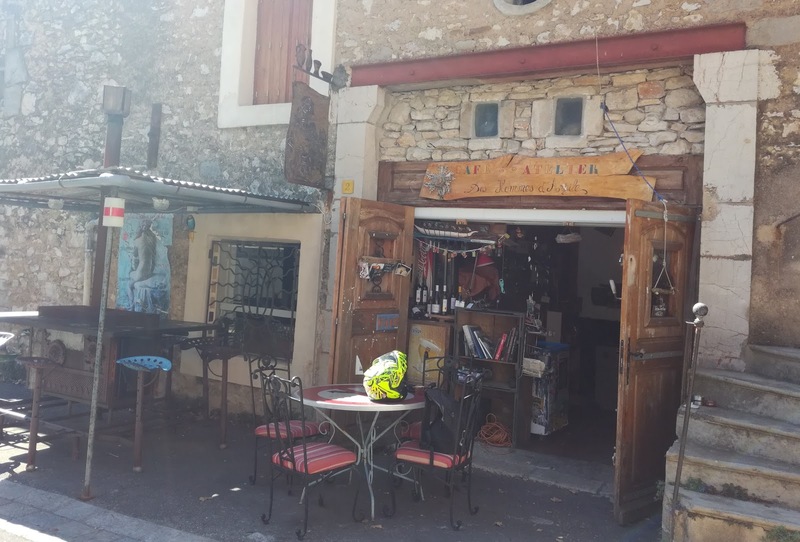 First stop for coffee was in a dinky village called Arboras which is a favourite area for mountain bikers. My son has been there to practice downhill riding with his group and had a lovely time. 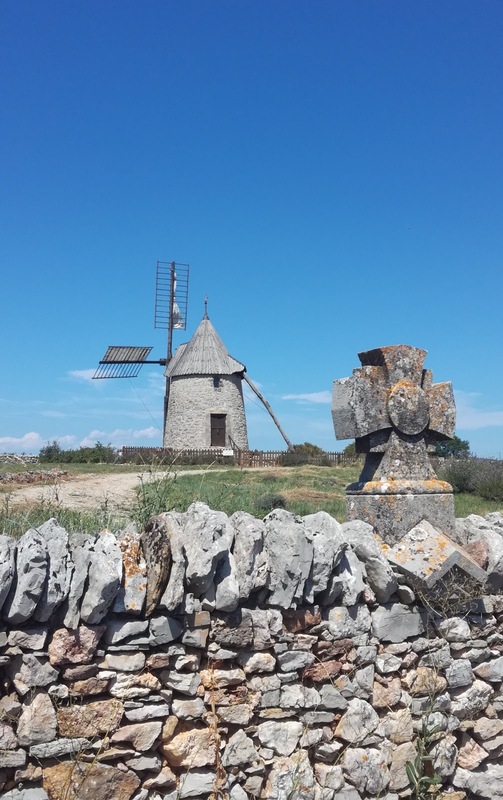 I left them enjoying a plate of local goats cheese, honey and bread, and continued my route. From the winding roads of Hérault, I climbed onto the Larzac plateau and the trip took me right down memory lane. I used to come this way a lot when I was married, before the A9 autoroute was built, and we had to take the National 9. The road is now the D9 and a lot quieter. 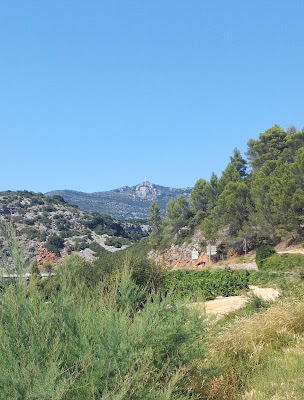 I always wanted to linger going through Le Caylar and L'Hospitalet-du-Larzac, and on the bike I could. I could dawdle along on the empty road, stop if I felt like it and admire the old stone houses, and take note of the appealing menus in front of the restaurants. 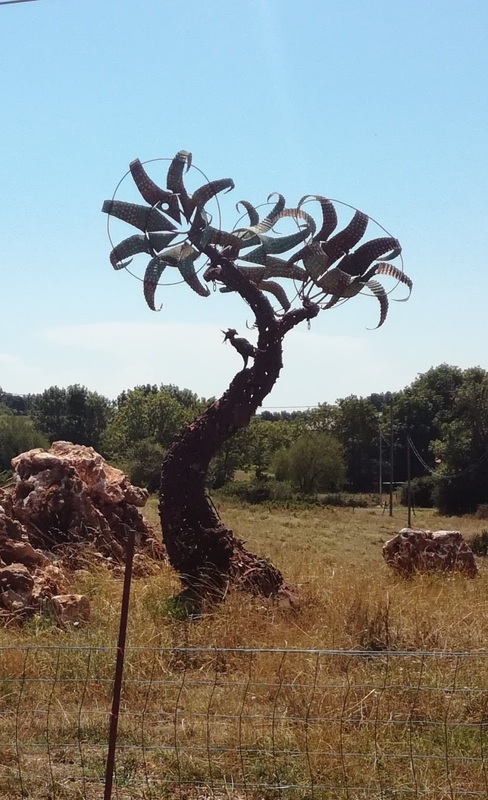 It was too early for lunch though so I stopped instead to take a photo of an iron sculpture seen along the way at Les Infruts. It felt much fresher up there on the plateau and I had a lovely time flying along in the cool breeze past the military training grounds, the Millau-Larzac aerodrome, and parallel to the autoroute. I thought of all the poor sods going north, their holidays over, and revelled in the fact that I live here year round. I wanted to eat lunch with a view, so I picked the spot where I knew I'd get the best one possible - of the Viaduc de Millau. There was shade, there were picnic tables, there was a panoramic view. I couldn't have enjoyed it more. 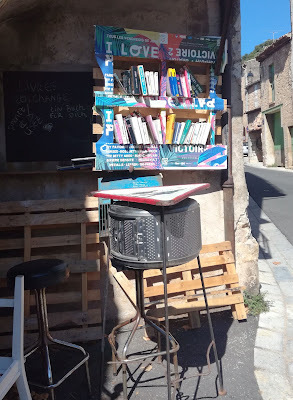 I shared a table for a while with a family who were on their way home to Brest having had a lovely time in Aveyron and the Camargue. The picnic spot had a special kind of loo which used no water but you had to press a lever ten times with your foot to work a moving belt. Intriguing. 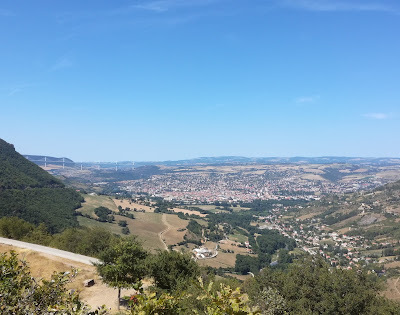 Millau was my target, so after I'd finished my very tasty sandwich, looked down on the soaring condors and counted a dozen para-gliders having fun in the rising thermals, I rode down the hill and stopped for a coffee at the river beach where there was a playground, pizza shack and bar. This time it cost €2.40... and came in a bog-standard white china cup. The location was pretty though and there were lots of people enjoying Sunday lunch with kids playing in the river in the cordoned off zone. It was very warm down in the valley, so I was keen to be back on the bike and on my way home. The 125 is not very powerful so I took it at a leisurely pace climbing back onto the plateau. Luckily no one was following me and getting impatient so I didn't need to push my bike to the limit. I took the same route home because you see different things from the other direction, and you can also stop and check places that you noted on the outward journey. 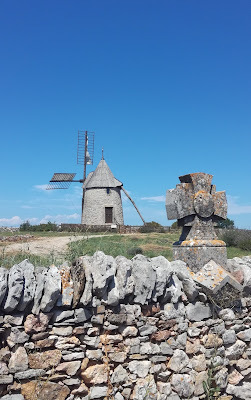 A working windmill at Saint Pierre de la Fage, for example. 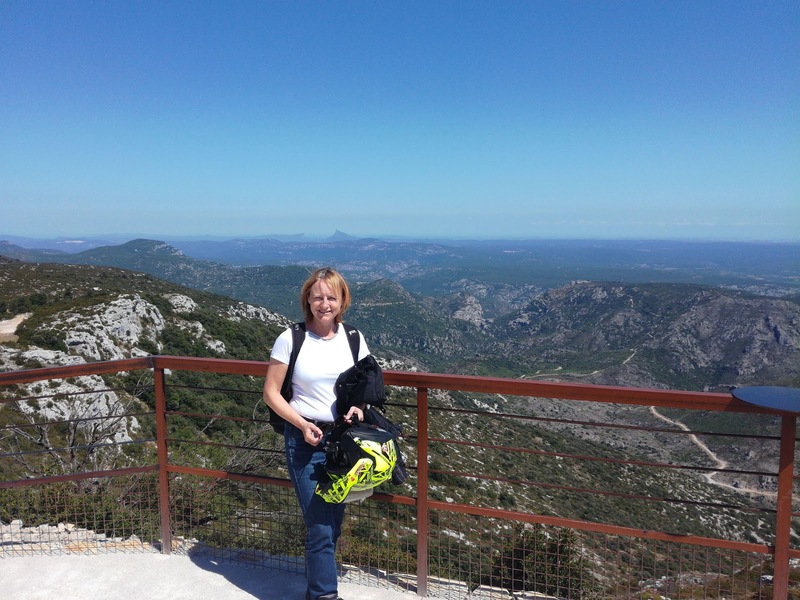 I came off the beaten track to admire the views from another high point of note - on Mont Saint Baudille at an altitude of 848m. I thought I'd be the only one trekking over there on the single track bumpy road, but the car park was pretty busy, to my surprise. There's an observation point where you can admire the view that extends on a good day from Mont Ventoux in the east to the Spanish border and Mount Canigou in the west! It's used in the summer by the forestry service to keep a look-out for forest fires. Two members of staff were there to hand out leaflets on how to not start a forest fire as well as keeping their eyes skinned. They spot at least one fire per day in the dry season. The views were fantastic - I could see the Pic Saint Loup, the Lac de Salagou, and way in the distance Montpellier and the sea. The forest service man very kindly took a photo of me - he's a biker too so we bonded... 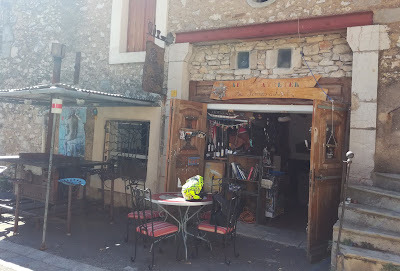 He told us that despite the place being isolated, there is a lot of crime in the car park, with cars full of holiday treasures broken into, and one woman even had her tyres slashed so she couldn't go after the thieves! There are some very nasty people out there. My bike was safe and sound when I got back to the car park I'm happy to say. I stopped briefly on the Col du Vent just to have a quick rest. There were no cyclists there on the return trip. Going up, I video-bombed a guy who was being filmed by his mates arriving at the top. I'm sure it was very hard work going up. I was happy not to be making that effort in such hot weather! I got home at 5pm to a nice cup of tea and piece of cake. It was a lovely ride full of varied sights and smells and I felt like I'd been on a mini holiday. I love my bike.